Each calendar year marks the start of some new food and nutrition trends in the health and wellness industry. The words simple, fresh and local might best describe how health conscious consumers are thinking about what they select in the grocery store, prepare at home, or look for on restaurant menus. Findings from the 30,000 people surveyed in the recent Nielsen’s Global Survey of Snacking found that more consumers care about the absence of ingredients than the addition of them. Snacks with natural ingredients are rated very important by 45 percent and moderately important by 32 percent. Snackers are requesting no artificial colours and flavours, no genetically modified organisms, along with caffeine-free and gluten-free options. Expect to see more fresh prepared snack items and whole foods offered in grocery store delis and cafeterias such as chopped ready-to-eat produce, heirloom vegetables and fruit, whole grains such as quinoa, and black rice as well as healthier meals to go. Restaurants will also be offering more ancient grains, root veggies, additional veggie options for sides, and healthier kids cuisine. More than ever, consumers are interested in finding out where their food comes from. The National Restaurant Association suggests locally sourced meats and seafood, locally grown produce, and environmentally sustainable foods are the top three food trends for 2015. Also making the list is reducing food waste, farm/estate branded items, artisan foods, and vegetarian cuisine. More grocery stores and restaurants are also sourcing and creating “craft foods” which are similar to popular locally brewed craft beers. Expect to see more artisan breads and cheese, house cured-meats/charcuterie and house-made ice cream and pickles. Pickling, fermenting, fire roasting and smoking will be popular preparation methods. Interesting smoothies, fresh pressed juices, and green veggie drinks are trending more than ever at home, in coffee shops, juice bars and restaurants. 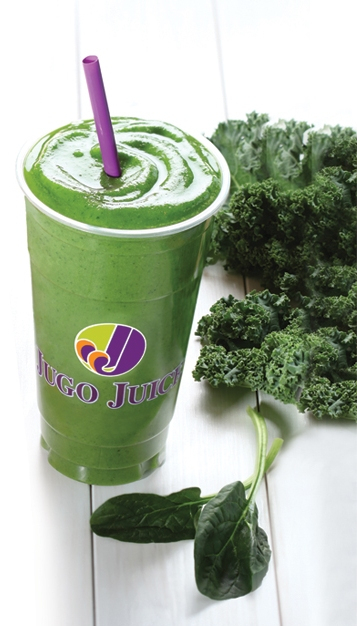 Being able to use simple, natural ingredients, and make healthy taste great, has been a tremendous success for the franchise Jugo Juice. The fastest growing category of smoothies for Jugo Juice has been the unstoppable rise of vegetable smoothies. As Canadians seek out more nutritious offerings and healthier snacks, you can expect to see more green smoothies and fresh pressed juices using both whole fruits and vegetables. Other beverages such as coconut water continue to be popular given they are sugar-free, low in calories, and contain natural electrolytes for active lifestyles. After water, tea is the most consumed beverage in the world and continues to be more popular than ever. Starbucks is in the tea business as it now owns Teavana after observing the increased trend in tea drinking. The successful growth of DAVIDsTEA is also an indication health conscious consumers are ready for a change from coffee. Expect to see more premium loose tea, fermented kombucha tea, and green matcha tea in 2015. Colossal plates and meals are gaining less and less appeal. Downsized meals, tapas, dim sum and share plates will continue to be popular restaurant options. Today’s consumers favour snacking more frequently over large meals, especially if you are between the ages of 18-44 years according to Technomic, a food-service research firm. Consumer research group Nielsen also suggests that baby boomers are also moving from a three square meal approach to eating to grazing on foods good for health and longevity. In the Nielsen Global Survey of snacking, more than three-quarters eat snacks often or sometimes to satisfy hunger between meals or to satisfy a craving. While indulgent snacks still rank as the top choices, consumers are snacking with a conscience. They are requesting low-sugar, low-fat, low-sodium, low-carb or low-calorie options, so expect to see more fresh prepared healthy snacks. While health and wellness continue to be a trend and strong interest among Canadians, in many cases good intentions are not yet reality. The 2012 Agriculture and Agri-Food Canada Consumer Report suggests that taste, price and convenience are the top influencers of food choices followed by nutrition. Grocery stores, food manufactures and restaurants have an ongoing challenge to come up with healthy food that is tasty, easy and affordable. It will be interesting to see who can supply this winning combination in the years to come.